Published by the Mazovia Institute of Culture, Warsaw, 2017; 288 pages, 119 colour and 11 black-and-white photos, 600 copies, ISBN 978-83-63427-63-4. Norbert Zawisza – Director of the Lodz Central Museum of Textiles from 1981 to 2014 and Chairman of every edition of the Lodz Triennial from 1985 to 2013 – is uniquely qualified to write about the field of Polish textile art. Nevertheless, in his introduction he states that he wants the artists to have their own say; art critics tend to provide well-reflected overviews, but their writings are not always conducive to a better understanding of the artists. The best information is supplied by the artist themselves. He explains his way of working from recorded conversations and earlier interviews with artists as well as information provided in telephone calls. Some artists lapse into silence when facing a microphone, and in these cases Zawisza resorted to compiling a number of statements from the artists’ earlier writings and asking if these views still are correct. Generally speaking, we find many of Norbert Zawisza’s own comments, and it is impossible not to pick up his opinion on the subject. For example, he uses the term “tapestry” which, in Poland, is synonymous with textile art in general. Other textile art, in his view, appears to be more or less identical with weaving or derived from weaving. The author states that his book is the most comprehensive work since the 1989 publication, “Contemporary Polish Textile” by Irena Huml which, unfortunately, was available in Polish only due to lack of funds. 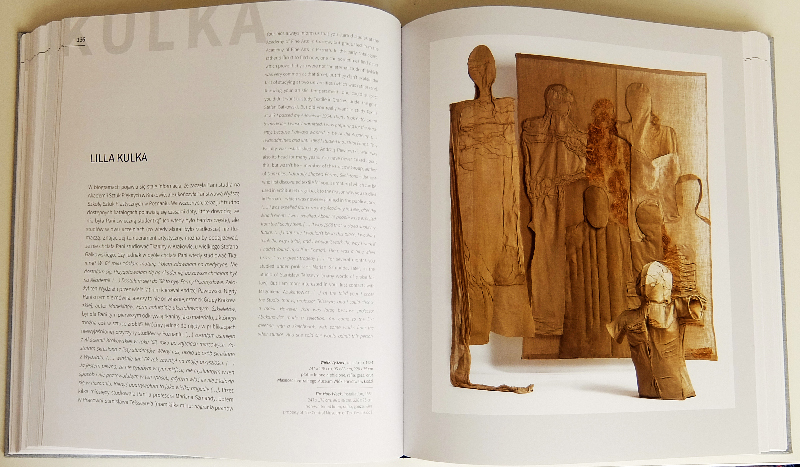 I gather that “contemporary” in this sense means “living” since famous Polish artists who are deceased, such as Magdalena Abakanowicz or Emilia Bohdziewicz, are not included in this new publication. Several artists are represented only by works from the previous century, the period when these were exhibited at the Lodz Triennial. This applies to artists such as Wojciech Jaskólta, Jolanta Owidzka, Irena Maria Palka or Jolanta Rudzka Habisiak. As regards the images, works which were awarded medals at the Lodz Triennials are given pride of place. This book is a must-read for all those interested in the modern history of textile art. It provides an in-depth view of the motivation and working methods of textile artists in Poland, a country that was and still is deeply involved in textiles. The book is available for 100.00 PLN from the publisher and the Central Museum of Textiles in Łódź.